Poppins by R for Rabbit has been designed keeping multi-tasking mothers in mind. Not only is it really functional but also is designed with the style conscious parent in mind. Soft touch fabrics create smooth curves and continuous lines give Poppins a luxurious and stylish look. The one-hand fold chassis is compact and freestanding when folded and is extremely light-weight to carry around town. 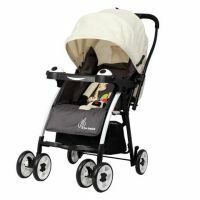 Pram features a multi-position recline, good quality wheels for a comfortable ride. Using a reversible handle pram also features a parent and forward facing seat which is spacious & comfortable for your baby. Certified for safety: Poppins is EN 1888 Safety Certified which is one of the most stringent certification defined by European Standards for baby prams & strollers. Strollers are crash tested, tested for mechanical strength and quality of colour & parts used. One Hand Fold: Poppins’s one-hand fold technology allows you to fold this pram in one easy step while still holding your baby. This pram will have you cruising the city in style. Very Light-weight: Designed with mothers in mind, Poppins is extremely light-weight at 6.5kgs making poppins lighter than most prams in the market by 3 kgs! Poppins is easy to fold & carry around with you to supermarkets, parks & malls. Multi-position Recline: Simple mechanism to make multi recline positions and give your baby a comfy ride. Seat lays all the way back - great for new-borns - and is easily adjusted to sit upright. 6 inch wheels with suspension: Poppins features 4 big wheels with 360 degree rotation & excellent suspension. You can easily take Poppins on pavements, medium length grass, mud and gravel keeping your child seated comfortable at all times! Modern Design: Poppins is designed keeping modern aesthetics in mind. Not only will your kid will love to ride in it, but also it will complement moms as their fashion accessory! Five Point Harness: 5 point harness keeps your baby cosy and safe at all times. Removable Meal tray with cup holder: Accompanied with Poppins is a fun meal tray with cup holder that is not only functional but also lots of fun! Reversible Handle with forward-facing & mom-facing seat: Poppins features a reversible handle that lets mothers have fun conversations with their kids while moving about town. Adjustable leg rest: Poppins by R for Rabbit has an ergonomically designed leg rest with fun “paw prints” that provides a comfortable seating position. To Recieve updates and possible rewards for R for Rabbit Poppins- An Ideal Pram- Baby Stroller For Moms (Blue/Black) please sign in. To Recieve updates and possible rewards for Strollers & Prams please sign in.